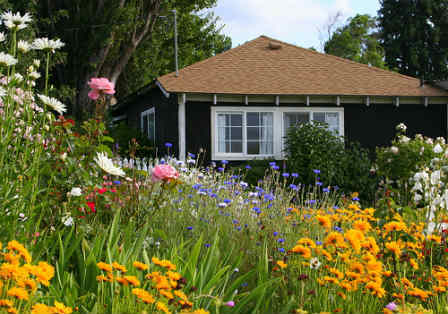 The overall effect of a cottage garden is a charming "mess" that does not quite cross into anarchy, so the spirit of these gardens can be described as a rich but harmonious disorder. As in the bookplate below, the choice of plantings and their arrangement in the garden has an appearance of disorder, while the disorder is fully contained. 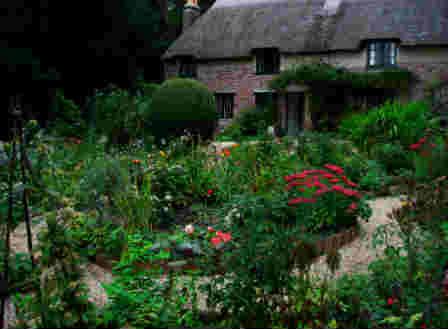 The cottage garden is the working man's garden, it's style dictated by reasons other than the design itself. 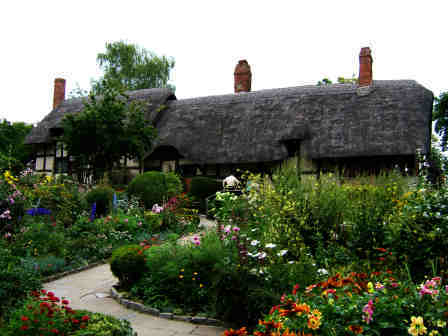 The specific roots of the cottage garden style are somewhat disputed, but historians agree that the style grew up first out of necessity, as a ready source of fruits, vegetables, medicinal herbs, and other useful plants dictated entirely by practical household requirements. At their roots, these gardens did not stop with plants, but included beehives and livestock with which the residents of the residence in question met their most basic needs. Garden plots were only as large as necessary to meet the needs of the tenants, and the plants included were enough to meet the needs, without any direct response to the idea of formal design. Any concessions to frivolity in the garden were the carefully propagated progeny of popular plants from the larger estates, perhaps a drift of tulips or the Crown Imperial fritillary, so popular with early artists. These concessions to the less than practical were further propagated and shared with neighbors and friends to form a delightful mix of the practical and the appealing which elevated these gardens to "charming" from their practical beginnings. 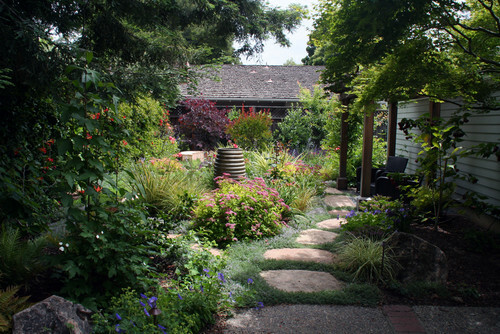 The distinctive garden look that grew up out of this practical approach to gardening was recognized during the 1870s as it's own distinct style, and was promoted by such gardening greats as John Claudius Loudon, Gertrude Jekyll and William Robinson. This 'new' gardening style fit the times, aligning with the social movement toward more natural gardens rather than the highly regulated formality prevalent in the early Victorian era. 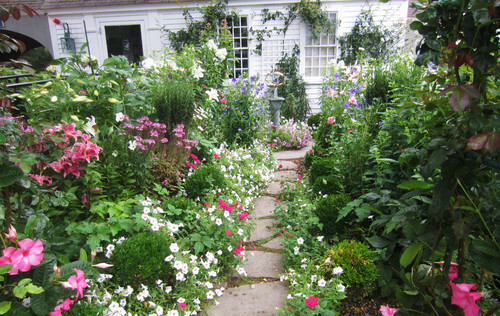 As the cottage garden style developed over the intervening years, the emphasis has moved from the practical to the charming, with less focus on planting for daily use, and more focus on creating a controlled disorder that has a unique and vibrant charm often missing from other garden styles. 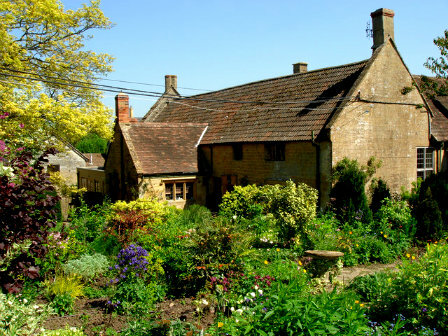 In the most recent years, with the return to a sustainable and green gardening emphasis, the cottage garden naturally lends itself to the inclusion of edible plantings and natural, sustainable materials, as it is in essence a return to the practical origin of the style. 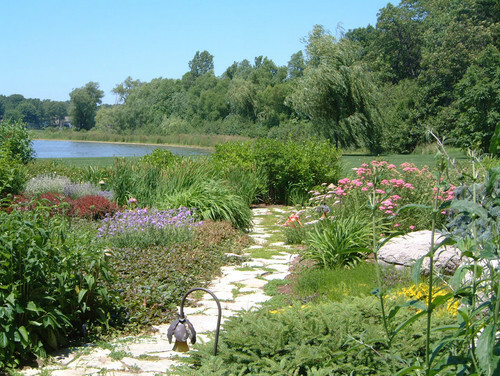 It's informal aspect and seemingly random placement of plantings allows the inclusion of such practical consideration without impact to the basic tenants of the cottage garden design style. 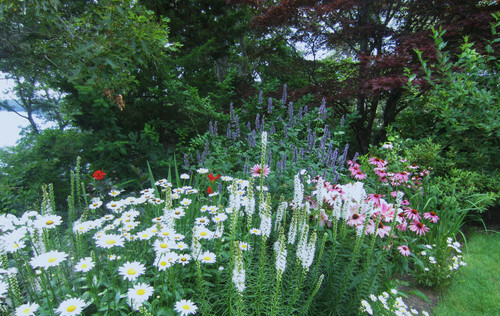 In spite of it's informal nature, the cottage garden has a very specific order to its disorder. 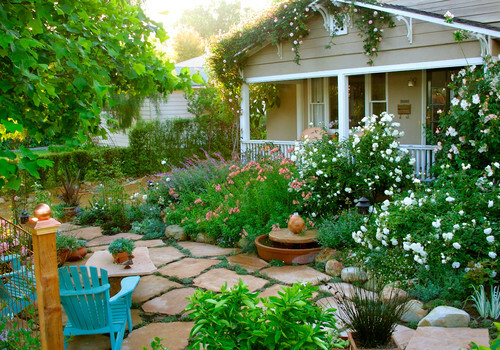 These elements of order are what define the modern day cottage garden style, while the overall effect of the style retains the spirit of disorder that arose from it's origins. East Lambrook Manor Gardens planted 1937.